Are you seeking the missing ingredients to move from good to great? To bridge the gap between strategy and execution? Are you looking for the next generation of skills, mindsets, and processes to transform your performance as a project manager, team member or sponsor? Are you ready to transform yourself…and then your organization? 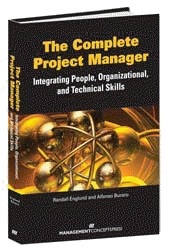 The Complete Project Manager learns how to integrate key people, team, business, technical, and organizational skills. You develop the leadership, learning, means, and motivation (L2M2) to advance both personally and professionally. This session shares experiences, attitudes, examples, stories, and passion that motivate action. Pay particular attention to specific soft skills via the story-telling approach, combined with a toolkit of assessments, checklists, and action plans. Case studies and practice sessions help participants learn from each other and immediately apply practices up, across, and down the organization, especially in politically charged situations. Fill up your toolkit to integrate knowledge and skills that make the difference in achieving optimized outcomes, increased satisfaction, and bottom-line results. The experienced presenter employs a storytelling approach to demonstrate what, why, and how of applying soft project management skills in areas of leadership, stakeholder management, humor, organization, environment, negotiations, politics, sales, and above all else—attitude. Organic metaphors illustrate memorable, action oriented concepts, based on real experiences, leading to immediately applicable action steps. Project managers with experience in the field, who have questions about managing projects with limited budgets, resources, or time; who are willing to give and receive feedback about experiences and learn from others; team members, advanced project managers; program and portfolio managers, and project sponsors who are challenged to communicate and negotiate with stakeholders and build effective teams, even in global economies. This course is ideal for professionals who are ready to integrate soft and hard skills to manage and achieve more from project based work. It is also helpful for consultants who want to broaden their scope in consulting engagements. And it should be of interest for executives looking to highlight skills and attitudes to look for and develop among their staff. Why should I participate in this workshop? While many professionals develop their craft through advanced education and on the job experiences, there comes a time when an enhanced skill set and a new perspective about working with people is necessary in order to advance to the next level of performance. How do you move beyond this plateau? This workshop provides a thorough, holistic approach to open eyes, minds, and doors, so that changed thinking can be applied immediately to each organizational environment. Step through the means to adopt, adapt, and apply a more complete approach to leading and managing people, leading to more consistent, timely, and quality results. This winning approach becomes possible because project managers apply necessary leadership, influence, sales, and negotiating skills that had previously been overlooked or under applied. Practice sessions promote conscious application of these skills—including the art of story-telling—and enable project managers to get recognized for achieving business outcomes that had heretofore eluded them. This set of increased competencies leads to greater levels of personal satisfaction and professional advancement. product developers on cross-organizational projects. Randy co-authored the best-selling business/management books: Creating an Environment for Successful Projects, Creating the Project Office, Project Sponsorship, The Complete Project Manager, and The Complete Project Manager’s Toolkit. A maximum of 30 attendees are allowed to attend this class. If the maximum limit of 30 has NOT been reached, then we will accept walk-in registrations on a first come, first served basis. Once this limit has been reached, the event will be closed to additional attendees. Checks payable to "PMI Silicon Valley"
Continental Breakfast, Coffee and Lunch will be provided.